Riverwind Project - Sew What Sew Anything - Sew What? Sew Anything! Closing out 2015 with the completion of the Riverwind project felt great. This was a project collaboration which began two years ago. Interior designer and friend, Patti Dudley brought me in to help on window coverings, some of the furniture re-upholstery, and fabric recommendations for the living room, resident’s rooms, and the dining room. • Choosing drapery fabric for an upholstery job. It will very likely not hold up. • Choosing a really bold design with no consideration of the other design elements remaining in the room. • Guessing at the right amount of fabric and not having enough to complete the job. • Choosing a fabric that looks good but doesn’t feel good. Back to the Riverwind project. I am so grateful to have been included from the beginning of the project. This gave me the opportunity to see all of the conditions and situations that needed to be accommodated in fabric selection. Riverwind is a 20-bed assisted living facility in Williamston that is situated on a beautiful piece of property close to the river. For the window coverings I was able to note the direction of the windows and the temperature needs of the room, as well as note the elements in the rooms which would remain such as flooring and paint color. The scope of the Riverwind project involved 13 Alta brand cordless double cell honeycomb shades in phase one. The double cell helps with the insulating factor. We installed them in the large living/dining room, office and library. 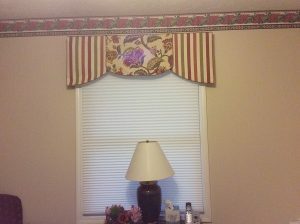 Valances were also installed in those rooms. This covered the shades when they are upright and it also help give a cozy feeling to the facility. For the furniture fabric choices I was able to see the furniture in use and understand the special circumstances or concerns about wear and cleaning. Most important I was able to take meticulous measurements of everything. Armed with this information it was possible to sit with Patti and her design plan and recommend the best options to bring her plan to life. Being able to recommend the right fabrics for the job is easy when you represent some of the best fabric designers available. You may be wondering why this project took two years. This was entirely a client decision related to budget availability and I have to say I admire the client for stepping into the project with a well-designed plan of execution. The last elements to be completed were the 20 residential rooms. Alta Cordless Honeycomb window shades were installed to replace the old and poorly functioning pleated shades. The new shades were a double honeycomb that has a great insulating factor. We hung a beautiful valance over each of the shades. With all the colors in the fabric selected it will allow the resident rooms to be painted different colors. This will help lend a more homey feeling to the facility. Congratulations to Riverwind for a beautiful plan completed, and thanks to Patti Dudley for bringing me in on this project! No matter the scale of your design, or whether you are designing yourself or have a pro on your team, it would be an honor if you would include Sew What Sew Anything in your team for fabric selection, creating custom home décor pieces, upholstery, and window treatments from shades to drapery.